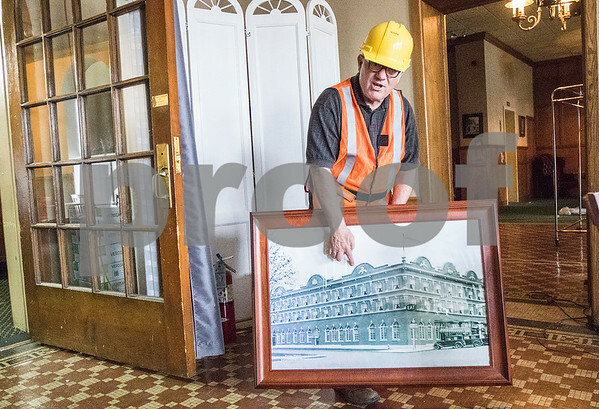 Pappas Development Project Manager Ralph Crafton points to a photograph from 1929 that once hung in the Fargo Hotel of the historical building in the lobby with the original mosiac tile on Wednesday, May 11, 2016. Demolition started Wednesday on the banquet hall that had been added on the back of the Fargo Hotel in the 1980's. Pappas Development will turn the 32 room Fargo Hotel into 12 single room apartments and four- two bedroom apartments, with room for commercial rentals on the ground floor on the new bulding they will call the Fargo Plaza.